Piyush Goyal said that for a taxpayer having capital gains up to 2 crore rupees, benefit of rollover of capital tax gains to be increased from investment in one residential house to that in two residential houses; can be exercised once in a lifetime. TDS threshold on interest on bank and post office deposits has been raised from Rs 10,000 to Rs 40,000, said FM. Standard tax deduction for salaried persons has been raised from Rs 40,000 to Rs 50,000. The government announced major tax relief to the middle-class by announcing taxable income up to Rs 5 lakh to get the full tax rebate. FM thanked all valuable taxpayers for their contribution in nation building. Individuals with gross income up to Rs 6.5 lakh will not need to pay any tax if they make investments in PF, PPF and other prescribed equities. Speaking on the government’s plan to make the country and unprecedented powerhouse in the next 10 years the FM Piyush Goyal said: We are poised to become a 5 trillion dollar economy in the next five years, we aspire to become a 10 trillion dollar economy in the next eight years. FM said “The government has proposed to increase allocation for the northeast region to Rs. 58,166 crore this year. It will be a 21 per cent rise over the previous year,”. GST has been continuously reduced resulting in relief of Rs.80,000 Crores to consumers. Most items of daily use for the poor and middle class are now in 0%-5% tax bracket. A group of Ministers are examining how prospective house buyers can benefit under GST. Steps are being taken to ensure that all assessment and verification of IT returns is conducted electronically within the next two years. There would be no intervention of tax officials. Piyush Goyal said impactful steps have been taken to reduce bring relief to middle-class citizens. Tax collection has increased to 12 lakh crore this year. “We are committed to eliminating the ills of black money; anti-black money measures taken have brought undisclosed income of about Rs. 1.30 lakh crore to the surface; 3.38 lakh shell companies have been deregistered,”. Gratuity limit has been increased from Rs.10 lakh to Rs.30 lakh. Pension scheme for unorganised sector workers with a monthly income of up to Rs.15,000 shall be provided. There will be assured monthly pension of Rs.3,000 after they retire on reaching 60 with a contribution of Rs.100 per month. Rashtriya Kamdhenu Aayog to be set up for cows. A 2 per cent interest subvention for animal husbandry, fisheries and farmers have been announced. Rs.750 crores have been allocated to cow protection. Direct income support of Rs 6,000 per year with less than 2 hectares of land, transferred directly to their bank accounts in three instalments of Rs.2000 each. Around 12 crore farmer families will benefit from the programme which will be implemented from December 2018 itself. The cost of the scheme of Rs. 75,000 crore annually will be 100 per cent funded by the government. Reduced cost of medicines, cheap health care facilities, setting up of world-class hospitals around the country is helping ensure that the benefits of competent healthcare reach every quarter of the country. Healthcare has seen a massive scale-up. 10 lakh people treated under Ayushman Bharat. Lower costs of stents and knee implants have helped people. The scheme resulted in Rs 3000 cr savings for households. The total Gross GST Revenue collected in the month of January 2019 has today crossed ₹ 1 lakh crore. This has been a significant improvement over the collection of ₹ 94,725 crores during last month and ₹ 89,825 crores during the same month last year. FM says we brought the average inflation is to 4.6 per cent, lower than any government. Had we not controlled inflation our families would have been spending close to 40 per cent more on essentials. The fiscal deficit has been brought down to 3.4 per cent as the revised estimates show. Finance Minister Piyush Goyal has arrived at the Parliament with the special Union Budget 2019 briefcase. After the Cabinet meeting, he will present the interim Budget 2019-20 at 11 am. All eyes are now set on what will be special in the budget 2019. 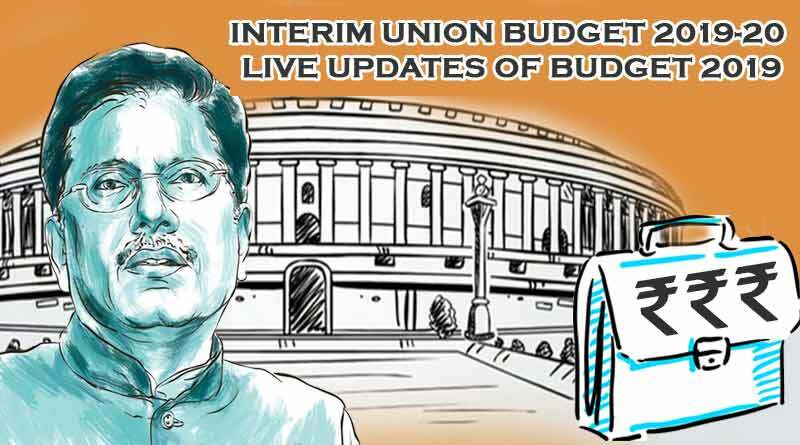 We will keep bringing you the live updates and highlights of the budget 2019. As this is the election year, only an interim budget is being presented by the government. People are expecting special benefits for salaried people and the lower and middle-class category. Stay tuned for Budget 2019 Live updates and highlights. For Budget 2019 Live updates and highlights, stay tuned with us. For more such updates, do Subscribe to our newsletter and follow us on Facebook, Twitter, and Google+.